Red Intuition wholesale red roses are unique with their red petals rippled or splattered with streaks of a lighter red. The Red Intuition head is quite large and opens to about 3/4 of a full bloom. If you want a unique red rose for your wedding flowers or special event, you'll love the Red Intuition. 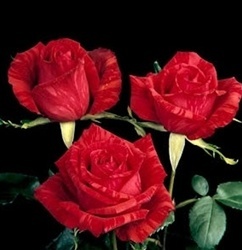 It is a red counterpart of the Pink Intuition rose. Free Shipping!